With the changing of the times, there also comes a changing of the style. Certain looks — the classics — are always in, however there are always those few players who attempt to buck the norm and swing for the fences with their ensemble. Sometimes it works. Sometimes it doesn’t. That’s the chance you take when you opt to be different. And while some choices on draft night were clearly off the mark, other individuals managed to make their NBA debuts in style. It’s not easy to be a talented player and a fashionista. But nowadays, pro sports and style go hand in hand. Fortunately, a few key rookies appeared poised to let their game do the talking both on and off the court. And we have a feeling they’ll look back on their draft night and have no regrets about their wardrobe selection. 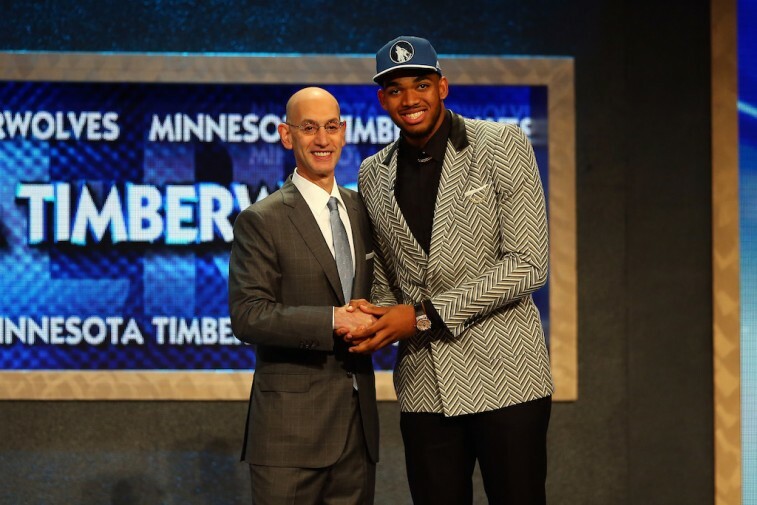 With that in mind, here’s a look at the five best dressed players at the 2015 NBA Draft. 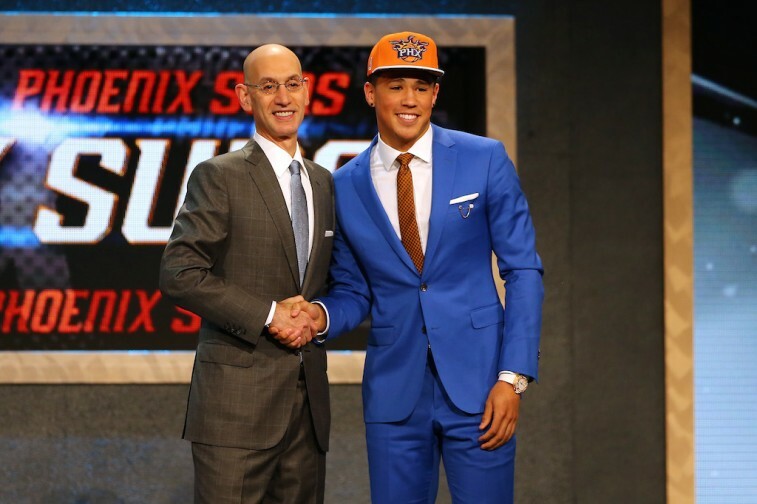 Not only did the Phoenix Suns get arguably the best shooter in the entire 2015 draft in Devin Booker, but they also snagged themselves a very sleek dresser. The Kentucky shooting guard owned this bright blue suit and he looked super sharp standing up there next to the commissioner. The color of the suit pops — without being too overwhelming — and we’re huge fans of the patterned orange tie. The watch is cool, the pocket square adds a nice touch to the ensemble, and Booker clearly gets his NBA career off to a great start. We enjoy this getup so much, that we’re willing to overlook that chain on the jacket pocket. Keep up the good work, Mr. Booker. At first glance, point guard Cameron Payne appears ready to take the country club scene by storm. His attire screams, “I own a yacht!” However, upon further review, we can’t help but respect the details on this draft-night look. His jacket is absolutely on point — double breasted slim fit cut with a beautiful navy blue tone. The pocket square is cool, the white flower shines, and the club color adds a unique touch to the whole ensemble. 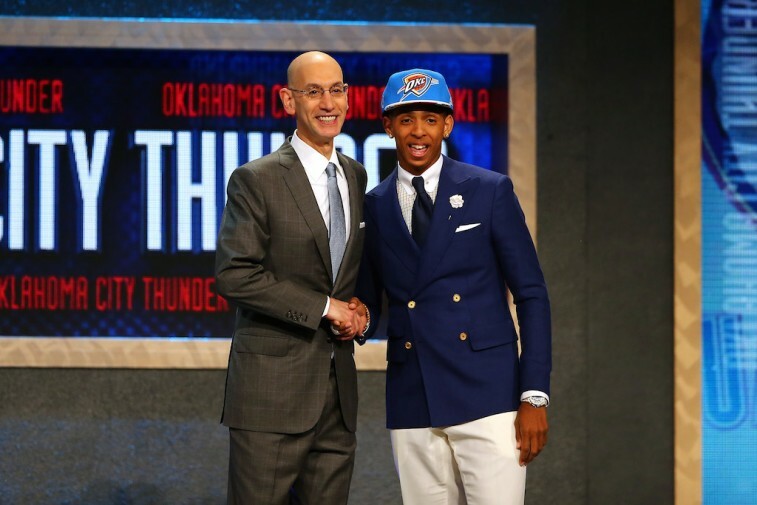 The Oklahoma City Thunder already have two of the best dressed athletes in sports today. With his stylish ways, it we don’t think Payne could’ve landed himself in a better position than OKC. 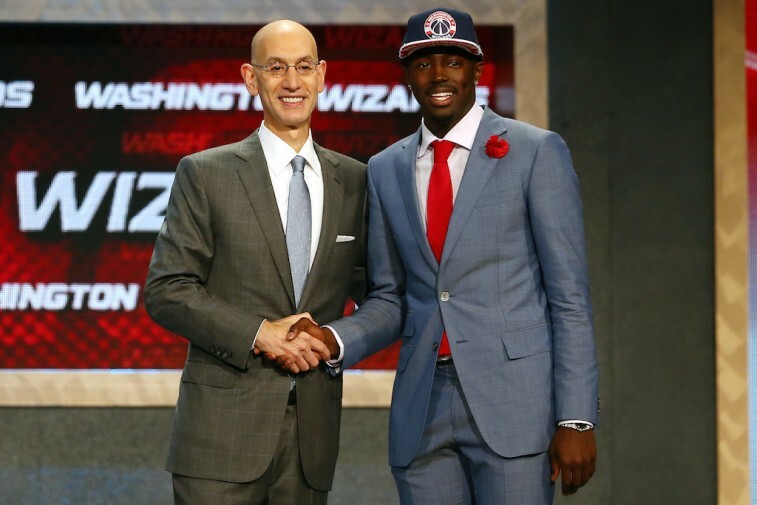 The New York Knicks may have acquired the draft rights to Jerian Grant, but there’s no denying that he made that Washington Wizards hat look good. That light gray suit is perfectly tailored and we’re totally enamored with the fabric. Usually we’d say the tie is too big and too bright, but we can’t really complain with the red windsor knot. If you throw in the flower of the same color, it’s quite clear the Notre Dame product knows how to pick out complementary accessories. This whole ensemble is further proof of Jerian Grant’s overwhelming maturity. The Miami Heat found themselves on the receiving end of one of the biggest steals of the 2015 NBA Draft. They also drafted one of the best dressed players of the night. Justice Winslow shows his Duke love with this perfectly balanced blue suit. The shirt is light, the suit itself is a gorgeous dark blue, the skinny tie is a sweet navy (with a stylish tie clip), and the pocket square never gets lost in the shuffle. 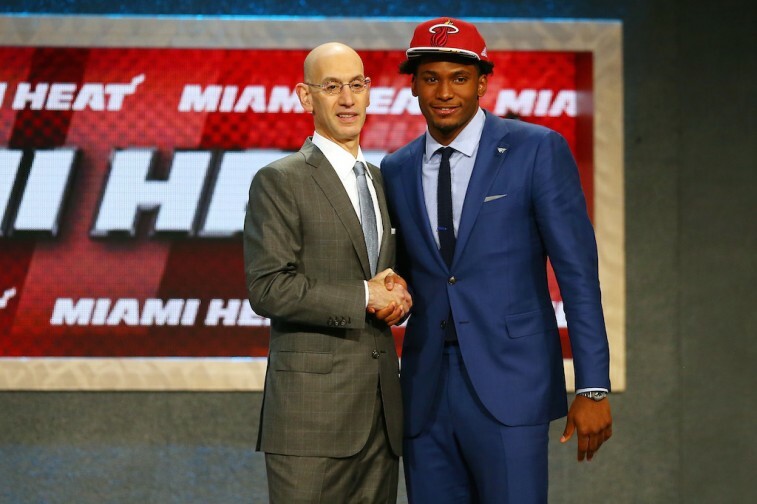 We have a feeling that Winslow is going to fit in quite nicely in South Beach. 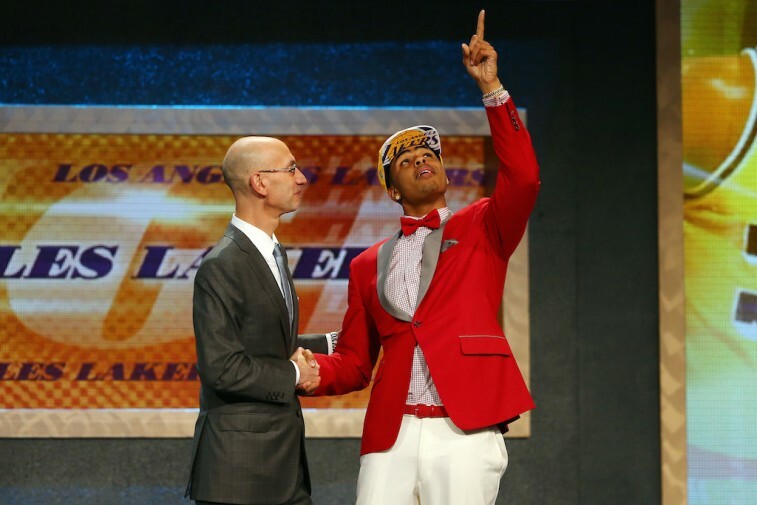 Some folks may feel that D’Angelo Russell went overboard in his tribute to THE Ohio State University. We are not part of that group. We love the two-toned red and gray jacket and dig the accompanying pocket square. The checkered shirt is equally fresh, going together quite nicely with the red bow tie and red belt. The light pants do a great job of keeping this look from going overboard. Of course, if we’re being completely honest, it’s the red slippers that really tie this outfit together. Alright Mr. DeMille, D’Angelo Russell is ready for his close-up.